Invasive species often flourish in their new habitats because their natural predators do not make the trip with them. Without predators to keep their numbers in check, species like the Green Crab and the Asian Shore Crab experience population explosions. Green Crabs abound on the rocky New England coast because their ability to survive in a wide range of environmental conditions allows them to evade predators by moving to more or less salty water than their pursuer can tolerate (Washington Department of Fish and Wildlife). The fact that no native species can effectively control the Green Crab population means that there is an ecological niche just waiting to be filled—something, or someone, has to eat Green Crabs to give native crab species a chance. Presented with an opportunity to help restore Boston Harbor’s ecological balance while balancing my food budget, I decided to try my hand at “culinary population control.” With the help of the intrepid Boston Harbor Explorers at the Harry McDonough Sailing Center in South Boston, I collected about a dozen of the largest Green Crabs we could catch. Although most Green Crabs measure about two inches from one end of their carapace to the other, the gargantuan specimens we encountered at Southie were three inches wide, on average. Although huge by Green Crab standards, our giants couldn’t compare to the Rock Crabs that most people choose to eat. At best, the bag of seething legs, claws and shells would be enough for an appetizer that my friends and housemates had never tried before. 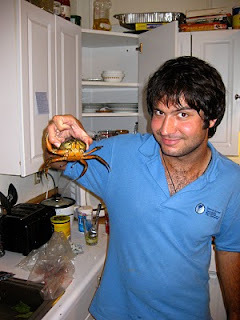 My friend Al, another adventurous eater, helped me prepare my first batch of steamed crabs. 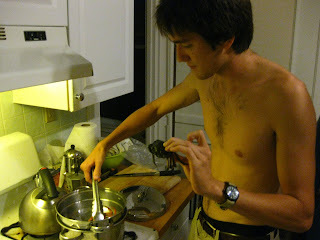 Our recipe, if you can even call it that, was stunningly simple: place crab in steamer, cover, wait, remove, consume. My first impressions of the crabmeat were fairly positive, but it quickly dawned on us that even the most massive Green Crab is miniscule by human standards; five minutes or so of digging through exoskeleton yielded only a few precious morsels. The Green Crabs also had a very strong, very particular flavor; similar to cooked lobster, but a lot fishier, and a bit brinier. I can imagine Green Crab bisque tasting excellent, but on their own they’re much more of a workout, hunting for bits of meat, than a treat. I can’t tell you how Green Crabs compare to Rock Crabs yet because I haven’t eaten “regular” crabs before. I grew up vegetarian, and only started eating meat a year and a half ago—crabs, at least the kind you buy in a supermarket, have yet to make it onto the list of animals I’ve sampled. 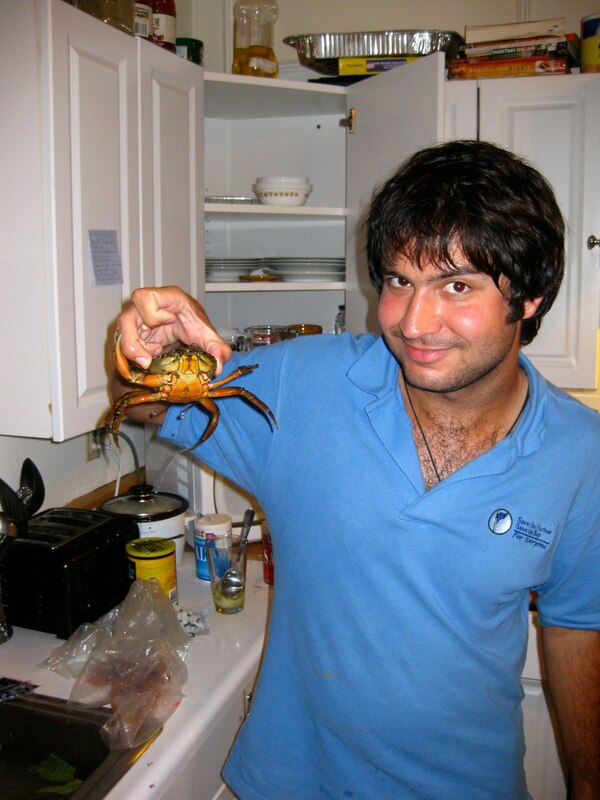 I hope to buy a few soon and, with a soon-to-be-revealed secret recipe from Bruce Berman, compare my experiences eating invasive and native crab species. Until then, I can only recommend that the adventurous eaters out there join me in experimenting with the perfect Green Crab recipe. Together, we can enrich our tables and our Harbor!